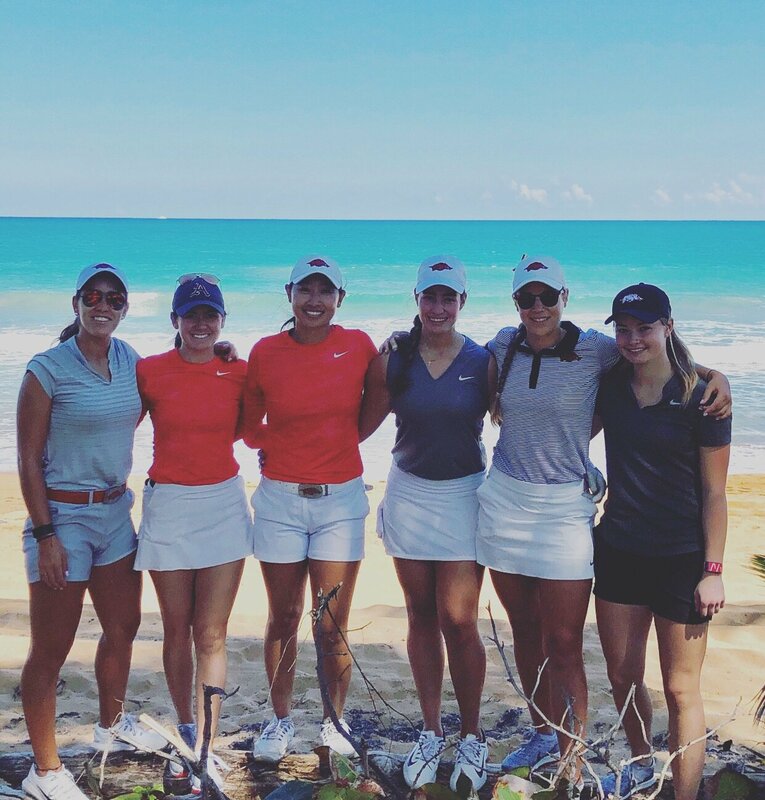 RIO GRANDE, Puerto Rico – University of Arkansas senior Dylan Kim paced three Razorbacks in the top-10 after first round action at the Lady Puerto Rico Classic in Rio Grande, Puerto Rico, on Sunday. Kim is tied for second place shooting a 3-under 69 in a round that featured four birdies on the River Course at Rio Mar County Club. Seniors Kaylee Benton and Maria Fassi are also among the top players in a T-6 shooting 1-under 71’s. The trio paced Arkansas to a one-over 289 and a one-shot lead after the first 18 holes. Senior Cara Gorlei and redshirt freshman Brooke Matthews round out the counting scores for the Razorbacks. The duo are T-56 shooting 78’s in the first round. Freshman Ximena Gonzalez, playing as an individual, is 21st and in the clubhouse with a 73. Arkansas continues play Monday and Tuesday with rounds two and three, respectively, at the Lady Puerto Rico Classic. The Razorbacks travel to Hilton Head Island, S.C., March 8-10, for the Darius Rucker Intercollegiate as the spring season continues. The Razorbacks and Blessings Golf Club host the 2019 Women’s and Men’s NCAA Championships in May. Check out NCAAGolf19.com for more information and volunteer opportunities. We got off to a solid start today. We got some good birdies coming in and it was just a good team effort today. It was a great start by Dylan today to shoot 3-under in the wind and rain. It was good to battle the conditions and just to get back into competition mode. We have a good game plan for this golf course and are in a position to accomplish our goals so we’re going to get a good night’s sleep and execute our plan over the next couple of days. •Arkansas has won the event three times and is the defending champion after the victory last season. •The Razorbacks played the par-4 holes 2-under for the game to lead the field. •Arkansas had 59 par holes, tied for the second-most on the day. •The Razorbacks had 13 combined birdies to tie for third-most on Sunday. •Dylan Kim led the field on the par-4 holes averaging 3.70 or 3-under in the round.